[ARCHIVED THREAD] - Gunshow Find! I was at a gunshow last weekend and was walking around first thing in the morning before everyone was set up, anyway I picked up an early smooth side upper (no foward assist) complete with early chome lined barrel, gas tube, straight delta ring and triangle handguards. Best thing is I got it all for $120! Now my questions. It has a birdcage flashhider, is that correct? I'm also thinking of putting together a rifle that would look basicly correct. I have looked at the Nodak flat side receivers but they are out of stock (and with the recent political climate not sure I want to wait till/if they get them back in stock) are there any other receivers I could look at finding that will at least match in color of my upper receiver? With the chromed barrel, a bird cage FH would be correct. Sounds like a late 604 upper. A full fence lower is the one that goes with that. I am probably wrong but didn't the 604 have a forward assist? The receiver that I have does not have forward assist so I thought it was a 602. As I say I'm probably wrong. If I can use a full fence receiver that would be great!! Then all I have to do is match the color. Will this Norrells finish I've been seeing mentioned match my upper? I will try to get a picture of it and post it for everyone to see. Or a takeoff from an SP1. If your upper is already gray, just use one of NoDaks NDS-16A1 lowers already anodized gray. Anyways, Norrell's moly resin "GRAYISH-BLACK Flat" is close. Here is a pic of a lower that was sprayed with Norrells. The upper is factory anodized. I am probably wrong but didn't the 604 have a forward assist? 604's are the USAF M16, and did not have a forward assist. 603's, XM16E1 & M16A1, have the forward assist. I'm building a 604 at the moment, that's why the receiver differences are fresh in my mind. Just waiting for NoDak Spud to get caught up and send me my lowers. 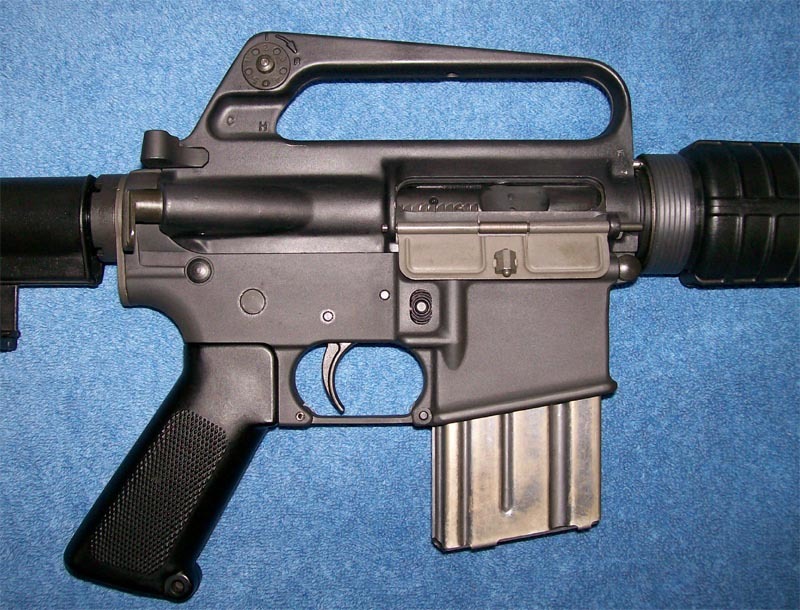 I might go with the anachronism of the full-fence lower with a three prong flash-hider. I used the link that you posted and my upper looks exactly like yours! Well looks like I'm making a 604 clone. To keep it simple I will keep the birdcage so I can do it up as a late 604 with a full fence lower and a bolt carrier with teeth on it. I found a web site called http://www.retroblackrifle.com/ you guys have probably already heard of it but I found it to be very informative. Thanks to everyone for all the help and when I get it done I'll post some pictures. I am not 100%sure, but i think a 3 prong flash suppressor is more correct, in the 80's, I carried 1 in Basic; slab side, 3 pronger. Only for a rifle so equipped. If the rifle has a partial fence lower, it is, but if the rifle has a full fence lower, then the birdcage is correct.